Andritz received the award at a gala awards ceremony in Cannes on 13 October 2016. The videos use a fast-moving, story-telling approach based on success stories to build Andritz Separation’s brand globally. The video series is available on YouTube and Youku, and is also shown during direct conversations with potential customers. 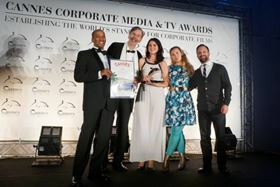 The award was shared with Zone Media, the company that produced the videos. Episode 1 – If a centrifuge works in theory, why make it bulletproof? Episode 2 – How to transform a desert coal mine into an award-winning oasis? Episode 3 – How do you satisfy over 100 million connoisseurs? Episode 4 – How can you handle 2 million challenges a day? Episode 5 – How can you handle the world’s toughest wastewater challenges? Episode 6 – How can you feed a nation of 252,000,000 people? Episode 7 – What does it take to get 20% more yield?